French brand Two Notes Engineering surprised us with a new series of four tube preamp pedals for guitar and bass they introduce at Musikmesse. 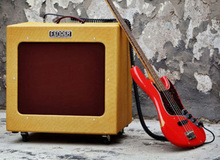 Warwick boosts the power of its LWA bass amp with the new 500W single-channel head. Laney completes this year its Nexus bass amp series with the new SL hybrid head that combines tubes and USB interface. We met the Ampeg team at NAMM 2015 for a presentation of the new SCR-DI bass preamp and DI pedal that includes the Scrambler overdrive. Ampeg introduces this week in Anaheim the new SCR-DI preamp, DI and overdrive pedal for bass. Tech21 unveils at NAMM 2015 a new amp head developed in collaboration with King’s X bassist Douglas Pinnick. TC Electronic will unveil tomorrow at NAMM 2015 a new series of bass speakers, the K210, K212 and K410. ISP Technologies will introduce at NAMM 2015 the new Pro version of its Theta guitar preamp pedal and the Beta Bass preamp pedal.